After a four-year hiatus, 007 returns to (domestic) theaters this weekend when Daniel Craig marks his third outing as James Bond. 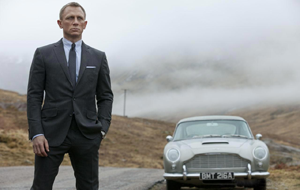 Skyfall has already amassed an incredible $287 million through just two weekends of international release. Fandango reports that Skyfall is outpacing Quantum of Solace by a margin of 2-1 at the same point in the release cycle. As of early Wednesday, Skyfall currently accounts for 53% of this week's sales (pre-Hobbit ticket sales which started on Wednesday). - The film's marketing campaign has successfully built up Skyfall as the first event movie since July's The Dark Knight Rises. TV spot and online promotions have been in very high circulation. - Early word of mouth from overseas audiences has been overwhelmingly positive, which could draw back any online fans that were skeptical after Quantum of Solace. - Ditto for critical reviews: Rotten Tomatoes currently scores the film with a 93% with an 8.3 average rating (Top Critics at 89% and 8.1). By comparison, Casino Royale scored 95% with a 7.8 rating (96% and 7.8 for Top Critics). - Craig's popularity as Bond has become strong over a short amount of time, despite Quantum. - The 50th anniversary marketing synergy has generated very high awareness. - Adele's hit radio single has further contributed to mainstream awareness of the film. - Quantum of Solace opened to $67.5 million four years ago (without IMAX). Today, that adjusts to $75.4 million with 2012 ticket prices. - Twitter activity has been off the charts compared to films such as Fast Five and Mission: Impossible - Ghost Protocol, thanks partly to the early overseas opening of the film. - Quantum of Solace left a bad taste in the mouths of some audiences, but Bond has always proven to be a resilient franchise. Pierce Brosnan's final two films increased in opening weekend figures despite middling word of mouth on his post-GoldenEye entries. - If Skyfall does suffer for Quantum's word of mouth, it could result in Skyfall being more back-loaded. - The strong word of mouth of last week's releases (Flight & Wreck-It Ralph) could have a minor impact. Check out our predictions for Skyfall and the rest of this weekend's top 10 in the table below. Argo Oct 12, 2012 Warner Bros.
Shawn Robbins, Phil Contrino, Daniel Garris and Alex Edghill contributed to this report.